Brighton is one of Britain’s most exciting coastal cities, full of culture, great shopping, and surrounded by the magnificent South Downs countryside. Get the most out of the city with our 1 day itinerary. For short trips like this one, you can book your individual rail tickets in advance through the Trainline. If you’re making a longer journey, one of the easiest and most relaxing ways to explore Britain is with a BritRail Pass that allows you unlimited journeys, giving you the freedom to explore at your own pace. Brighton is just an hour’s journey from London by train. Trains run regularly from London Victoria, London Bridge and London St Pancras Intl. King George IV’s magnificent pleasure palace is known, rather understatedly, as Brighton Pavilion. Built with grand Indian-style architecture on the outside, its interior is decorated like a Chinese palace, with golden dragons and brilliant colours. Take a guided tour to find its fascinating history. 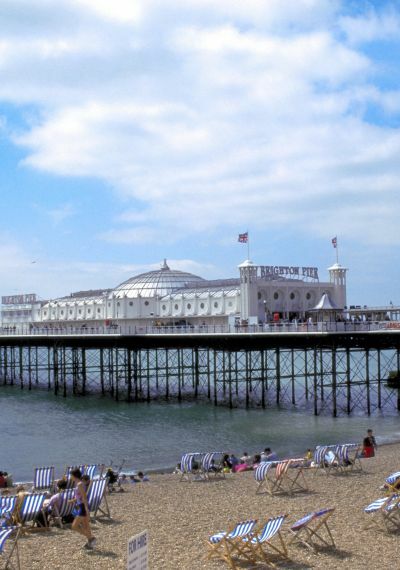 The Pavilion is a 10 minute walk from Brighton Station. Take a voyage to the depths of the ocean at the Sea Life centre. You’ll see everything from sharks to stingrays, seahorses, turtles and more, while you learn all about life underwater, conservation and the animal’s feeding habits! You can get here from the station on foot in 10 minutes. Get one of the best views of Brighton from the top of the futuristic BA i360, the world’s tallest moving observation tower. You’ll be lifted to 138 metres in the tower’s glass viewing pod: from that height, you can take in Regency Brighton, the beautiful landscapes of the South Downs and all the way to Beachy Head, the Seven Sisters and the Isle of Wight. Once the historic heart of the city, The Lanes are a series of delightfully winding alleyways full of a huge variety of independent shops, from jewellers to antiques dealers, record shops and lots more. Whether you’re looking to browse or just want to explore this picturesque part of the city, the Lanes are definitely worth a look. The entrance to The Lanes is a 10 minute walk from Brighton Station. Brighton’s major commercial shopping centre, Churchill Square is the place to go for all your high-street favourites and chain brands. It has over 80 shops, restaurants and cafes, and it’s open 7 days a week, so it’s ideal for lunch, dinner or serious shopping. Churchill Square is a 10 minute walk from Brighton Station. North Laine is Brighton’s most Bohemian district. Cool cafes, street performers, arty bookshops and record stores, vintage fashions, 50s kitsch and up and coming designers are to be found here in abundance. Being by the sea, Brighton’s just the place to sample the popular British meal, fish and chips! The Regency is one of Brighton’s oldest restaurants: opening in the 1930s. Prior to that the building was the home of Harriet Melon, one of the richest women in Europe! It serves sea food of all kinds, so either tuck into fish and chips or try something more adventurous. The Regency is a 20 minute walk from Brighton Station. A top spot for people watchers and people who love to be among the bustle, the Dorset is right in the heart of Brighton’s lively North Laine. Grab some fish and chips, mezze or traditional pub food along with a pint of local ale. The Dorset is a 5 minute walk from Brighton Station. With a prime position on Brighton Pier, Palm Court is considered ‘the spiritual home of fish and chips’. Settle in for a meal, or grab takeaway and take a seat on the pier overlooking the sea. Just keep an eye out for the local seagulls, who are particularly partial to fish and chips. Palm Court is a 15 minute walk from Brighton Station. If you’re exploring Britain by train, a BritRail Pass is the easiest and most cost-effective way to travel. For a single fixed price, you can make unlimited train journeys around the whole country or a region of your choice. BritRail tickets are exclusive to overseas visitors so you'll need to buy your ticket before you arrive in the UK.